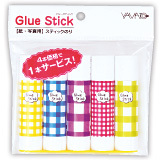 ‐ Light-duty permanent glue works on paper, photos, fabrics, envelopes and many more. ‐ Acid-free; photo safe. Paper won't get wrinkled. ‐ Dries clear. Washable, non-toxic.